All our dressings are made of the very highest-quality cotton produced by plantations in North Carolina, USA. Our wide range of products includes dressings in children’s sizes and many practical accessories. GeniMedical’s lightly ribbed cotton stockinettes are made of 100% unbleached cotton and come individually wrapped on a roll. GeniMedical’s lightly ribbed Cotton Body Jackets come in a box of five and are made of 100% unbleached cotton. Their flat seams provide a high level of wearer comfort. GeniMedical’s lightly ribbed Cotton Body Hips come in a box of five and are made of 100% unbleached cotton. Their flat seams provide a high level of wearer comfort. GeniMedical’s lightly ribbed Pre-fab Scaphoid Stockinette come in a box of ten and are made of 100% unbleached cotton. Their flat seams provide a high level of wearer comfort. This finely and seamlessly knitted Terry Stockinette is made of 100% unbleached cotton. GeniMedical’s terry cloth stocking is highly suited to bandage situations which do not require bolstering. Thanks to its excellent elasticity, the material can be applied precisely and without folds, thus resulting in improved wearer comfort. 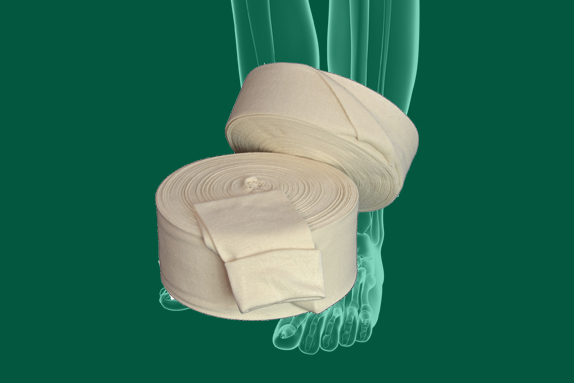 GeniMedical’s Webril Cotton Padding, made of 100% cotton, is highly suited to bolstering plaster bandages and synthetic plaster bandages, and to bolstering the UFS system (cork splints). GeniMedical’s Terry Foam (available in white and dark blue) is highly suited as a finishing layer on removable applications, so as to protect the patient from hard materials. An adhesive layer has been applied to the entire surface of the terry cloth, as a result of which the cloth sticks well to different types of materials. Available in four sizes. 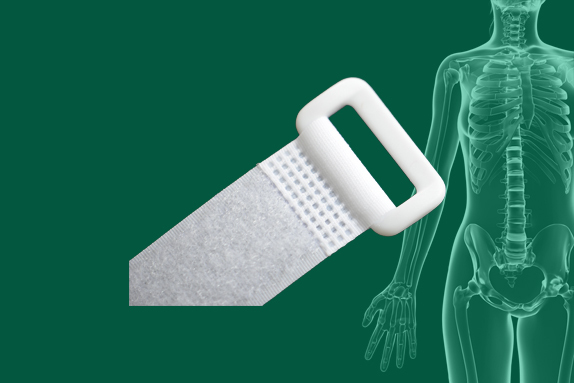 GeniMedical’s velcro straps are made of woven polyamide and come in two forms: hooks and loops. By pressing the two straps against each other, they can be reliably and securely fastened, and easily be unfastened. In addition to the standard non-adhesive and adhesive velcro straps, we also offer elastic velcro straps, which are available in several sizes. Unless otherwise stated, the straps are white. Coloured straps are available upon request (except elastic loops). GeniMedical’s ring straps are made of woven polyamide. A longish loop strap is connected to a shorter hook strap by means of an ultrasonic joint. The end of the hook strap comes with an easy-peel hook, which means that the straps can be easily unfastened. By passing the hook strap through the buckle, then pressing the loop strap down on it, the straps can be reliably and securely fastened, and easily be adjusted. Ring straps are available in several sizes. Unless otherwise stated, they are white. Coloured ring straps are available upon request. GeniMedical’s splint straps are made of woven polyamide. A loop strap is connected to a hook strap by means of an ultrasonic joint. By pasting the hook strap to the desired material, then pressing the loop strap against it, the straps can be reliably and securely fastened, and easily be adjusted again and again. Splint straps are available in several sizes. Unless otherwise stated, they are white, but coloured splint straps are available upon request. GeniMedical’s elastic splint straps consist of an elastic loop strap which is connected to a hook strap by means of an ultrasonic joint. By pasting the hook strap to the desired material, then pressing the loop strap down on it, the straps can be reliably and securely fastened, and easily be adjusted. Splint straps are available in several sizes. GeniMedical’s polypropylene tape is a durable alternative option for fixating removable braces. Available in white and black. GeniMedical’s Toe and Finger Splints (standard issue: skin colour or dark brown) are made of woven polyamide, just like GeniMedical’s velcro straps. GeniMedical’s synthetic buckles are available in several varieties. Thanks to the special way in which the buckles were designed, they do not twist while they are being used. Unless otherwise stated, buckles are white, but black buckles are available upon request. If you wish to receive more information on our products, or if you would like to talk to one of our representatives, please do not hesitate to contact us.